October 2015 – The Children's Museum at La Habra Blog! Pumpkin carving is a Halloween tradition that encourages young and old to roll up their sleeves, dive in, and get messy! It is a wonderful opportunity for families to take a moment to create and work alongside their little ones! Feeling uninspired and doubtful of your pumpkin designing skills? Well, fear not! For some pumpkin carving ideas for kids check out this article from Better Homes and Gardens! Engage your little one’s creativity and think outside the box to add some character to your gourd. There are endless ways to decorate a pumpkin. Paint, carve, glue- whatever the design you will be providing your youngsters with a memory that will last a life time! Don’t forget about our Mini Monsters Bash on Friday, October 30th from 10-12! We will be having special Halloween themed crafts, a mini maze, and presentations of our critters! PizzaRev in La Habra will also be hosting a fundraiser for the museum! Stop by anytime from 11am-10pm and mention the museum to support the Children’s Museum at La Habra! Hissing Cockroaches Are Now on Display! If you’ve been down to our Nature Walk recently, maybe you’ve noticed we have a few new animals on display! 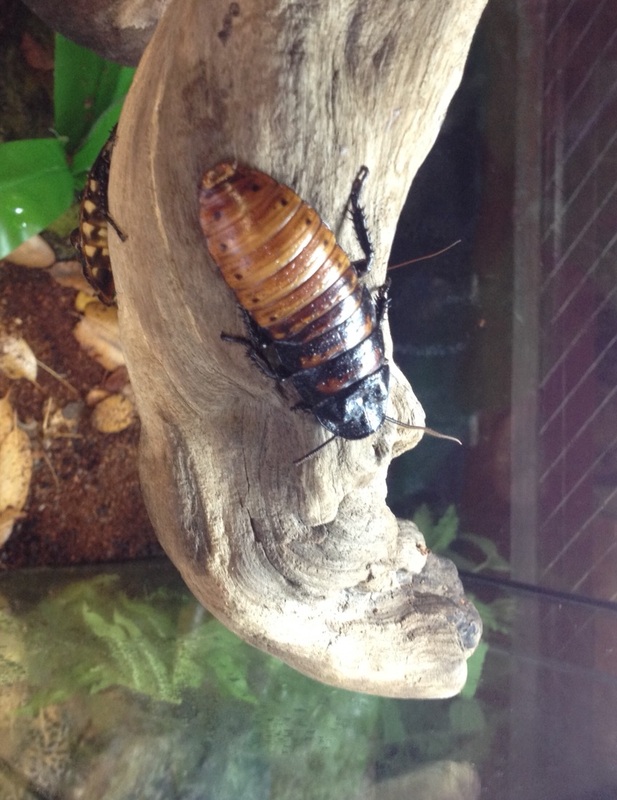 A family of Madagascar Hissing cockroaches now call the museum their home. These insects start off smaller than a watermelon seed, but will eventually grow to around 3 inches in length. As their name would imply, they are native to the island of Madagascar off the coast of Africa, but are now popular as pets or exhibit insects around the world. In the wild, they are a food source for lizards or other insects. Their trademark “hiss” sound scares off predators or attracts females, and is produced by forcing air through their spiracles, or breathing holes. Now, we know that cockroaches get a bad rap as household pests, but in the wild they are an important part of the ecosystem. They eat dead and decaying plants on the forest floor- think of them as nature’s vacuum cleaners! Here at the Children’s Museum, they are fed a diet of fresh fruits, vegetables, and grains or dog food. We hope you can meet them soon! What are the differences between an insect and an arachnid (like a spider)? Is the hissing cockroach an insect or an arachnid? Can you find Africa on a map? What about Madagascar? Let’s play make believe! Can you hiss like a cockroach? Pretend you’re a cockroach crawling on the forest floor. Help us break the world reading record (again!) for the most people reading the same book. This Tuesday children and adults worldwide will participate in the world’s largest shared reading experience. This year’s campaign book, Not Norman: A Goldfish Story, written by Kelly Bennett and illustrated by Noah Z. Jones, is a humorous tale about a child who finds a new friend in an unexpected place. Not Norman is a beautifully illustrated book that will quickly become your child’s favorite bedtime story! Meet us in the Nannie’s Travels Gallery throughout the day for scheduled readings of Not Norman: A Goldfish Story! We will also be making a craft inspired by this tale in our Family Art Center from 11-3. Do not forget to check our website for other fun events on the horizon! Our Mini Monster’s Bash is only weeks away! Get those costumes ready and join us for this absolutely delightful day of Halloween fun! Dia de los Muertos at the Museum! Day of the Dead may sound like the latest zombie movie in theaters, but it is in fact one of the largest Mexican holidays celebrated. Dia de los Muertos, or Day of the Dead is the Mexican celebration of All Souls Day, a day to honor loved ones who have passed on. Held on the first and second of November, this day is celebrated by building of altars for loved ones, visiting the graves of family members, as well as parades, dances, and music to honor the dead. One of the most important elements of Dia de los Muertos is the altar. Altars can range from elaborate pieces adorned with lights and flowers to humble altars made from a shoebox. For an in depth look at the symbols represented in an altar check out this article from the Latin Times! One of the most symbolic expressions of this holiday is the Calaveras, or skull imagery that is displayed as masks, costumes, sculptures, and even candy that children decorate. Calacas, or skeleton sculptures are often seen represented wearing fancy, colorful clothes and enjoying entertainment. Day of the Dead inspired artwork generously donated from the art department from Cal State Fullerton can be seen in our Nannie’s Travels gallery for the next few weeks. Also, join us in celebration of this culturally rich holiday for our Target Free Sunday on November 1st, students from the Lynwood High School’s Art Academy will be painting faces all day!